A Zen garden is much more than designing with pile of rocks, sand, and bamboo plants. A Zen design garden is landscaping to re-create the scenes of nature. Zen gardens have been known to promote a more holistic ambiance and setting. A Zen garden design is not just about creatively arranging stones. It is about landscape design that re-creates the scenes of nature with balance and harmony. A Zen-inspired design garden strives to be true to the essence of natural landscapes. How to design a garden? First, let the clear mind seeks inspiration in natural landscapes. Then feel the natural spirit of the space and in stillness, study the surroundings. Be aware of the energy of the space . . . calmness, clarity, purity and openness. It is essential to feel the spirit of Zen, for a Zen landscape to flourish. At nature’s most beautiful phase, create a garden in its likeness. Think of rocks and gravel, water and lilies, moss and woods combined in perfect harmony. Build paths, ponds, and shades. Design a garden with a lattice fence made from bamboo. 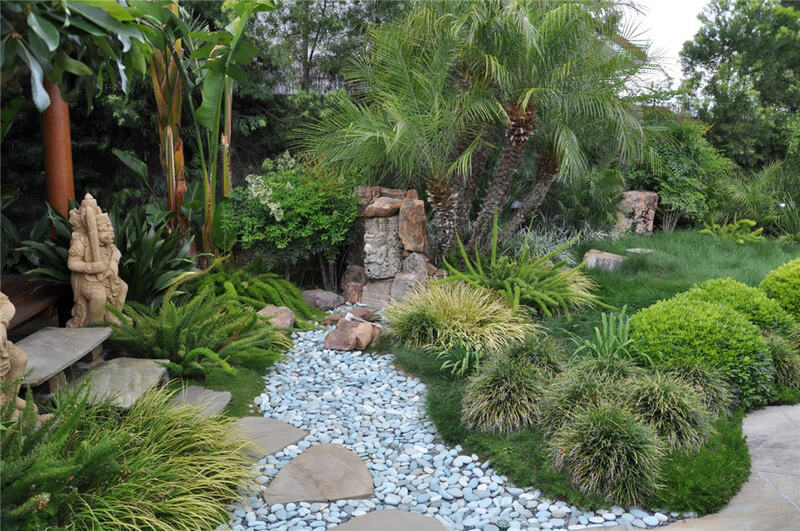 Let water flow through piles of stones to cool the landscape and the moisture-loving plants. A landscaping design with a garden pond can be a challenge, but it is a feature well worth the effort. A garden pond is a beautiful feature that is beneficial to the surrounding plants. The trickling water over stones, springing from a garden pond creates a tranquil, soothing sound and lends a cool and fresh feel to the landscape. A pond is best if built in the low-lying part of the garden, not too far from the house and not too close to the trees. If there is no enough space in the garden to build a concrete pond, use old copper containers, barrels, or big pottery urns as instant garden ponds. Sink the container to the garden ground, leaving a few centimeters at the top. Fill with water and submerge some water lilies in pots. Arrange rocks and stones to border one side of the garden pond. Add a water feature to your pond to create a fountain or waterfall. The sound of moving water could be a perfect contrast to the peaceful and tranquil surroundings. Water is a common garden feature in many Asian gardens. The soothing sound of trickling water gives a refreshing atmosphere of energy and movement. In dry areas, place a big sand box of raked sand to symbolize flowing water. Add a wooden hand basin, some plants, and rocks to introduce the presence of water. Terracotta potted plants are beautiful in any part of the garden. Flower filled terracotta pots can make a feature entry, a grand parade on a simple path, or as spectacle on a terrace. 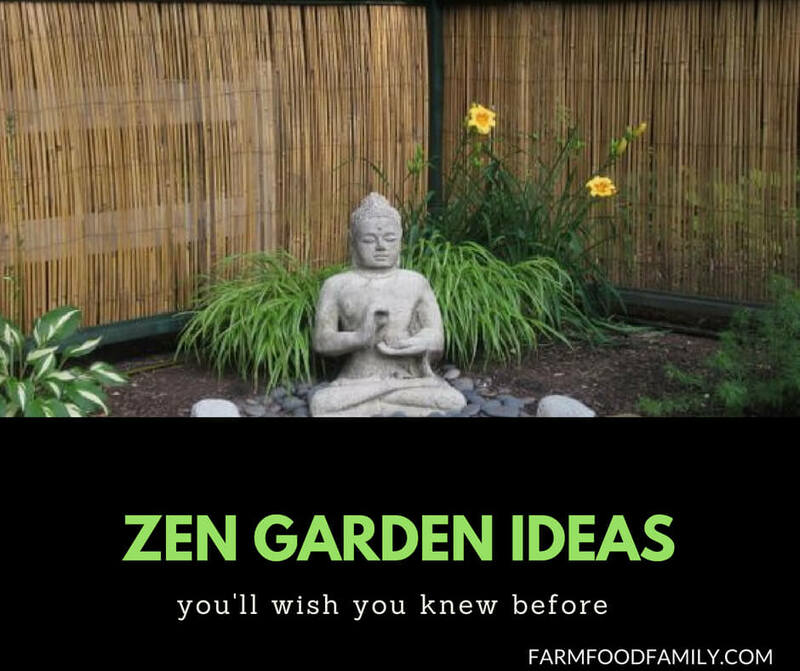 Use potted plants to bring Zen-powered creativity to any garden landscaping. In creating a tower of plants, terracotta is the perfect partner. Terracotta jars and pots set off flowers and greens quite so well. They come in a range of shapes and sizes that allows interesting groupings. Terracotta jars earthy tones can display very well plants with deep green foliage. Dwarf Zinnia, and French marigold are plants that will look gorgeous in terracotta strawberry pots. Terra cotta means baked earth. Zen landscaping design is a reverence for the beauty and simplicity of nature. Natural stones make an eye-catching pathway from the entry to the garden to the patio. Garden paths made of hardwood slabs are perfect for Zen design gardens. Pieces of stones pushed into wet concrete can make a handsome surface. Bordered by evergreens, the garden path becomes a walk-on work of art. There is a huge variety of materials from which to make garden paths. Old bricks gathered from demolition sites can look naturally weathered garden paths. Bricks arranged in basket weave paving pattern make a garden path with a timeless appeal. A mosaic of ceramic tiles could suggest a meandering stream flowing through the garden. Garden paths are more than just practical necessities, they are great garden design ideas. Zen garden paths serve as guides around the landscape, leading to the other elements in the garden. Sculptures from the old arranged along the pathway can slow down a hurried pace. Rocks, stones, and greens may be added as border to a wooden pathway for balance and harmony. If possible, design garden paths wide enough for two persons to walk abreast. An ideal garden landscaping should begin with the design of a focal point. A cherry tree beside a wall made of stone and a wood bench could make a stunning garden focal point. The cherry tree illustrates life, and the wooden bench could encourage reflection on life, while the stone can stand for strength and timelessness. Plant trees on the sunny part of the landscape. Plant some bright yellow blossoms to suggest yang energy and dark green plants to mean yin energy. A combination of rock, water features, pruned trees and bushes create a stylish garden. It is the art of Japanese rock gardens or zen garden. 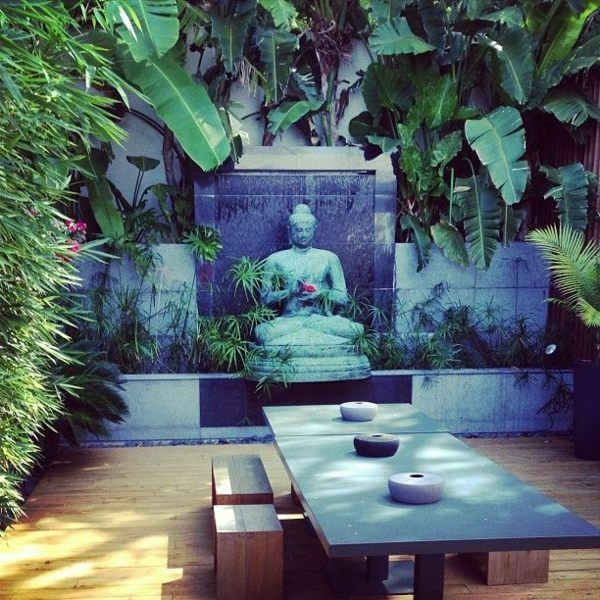 If you add a Buddha statue, the garden will bring a spiritual beauty. 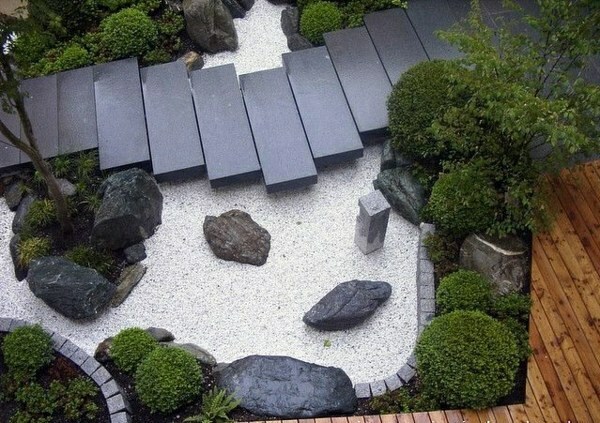 Let’s explore 41 beautiful zen garden designs I listed in this article. It is great if you apply to your garden.